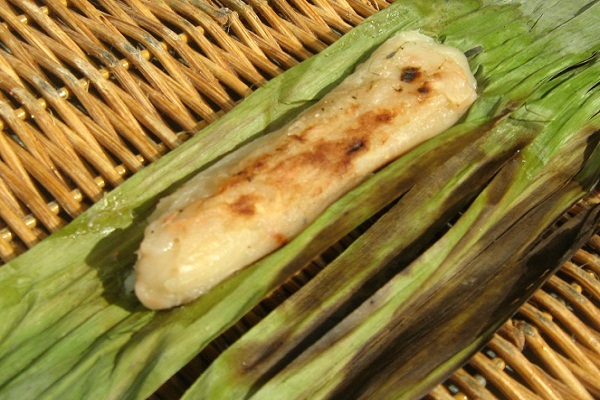 Intemtem or Tupig is a native delicacy from a town in Pangasinan. Tupig is a mixture of glutinous rice (malagkit) soaked over night, finely grind and grated coconuts wrapped in wilted banana leaves and cooked over artificial grill made of roof top like metal on a lit charcoals. There was even a competition held among several provinces to make it to the Guinness Book of World Records for preparing the longest “tupig” (a variety of rice cake). For the people of the northern provinces of Luzon island, cooking and selling “tupig” is rooted in their way of life, is a source of livelihood, and a regular fare during festivals and the Christmas celebrations. 1. Extract coconut milk from mature coconut by adding water and squeezing out gata or coconut milk. 2. Strain and set aside. Add remaining ingredients to coconut milk. Mix well. 3. Pour ¼ cup batter on wilted banana leaves, roll and seal ends. 4. Bake over live charcoal 15 to 20 minutes or until done.